Though the smile on her face and bright, pink volunteer t-shirt might fool you; Vicky Shockey knows first-hand what it's like to be homeless, and struggle just to have a roof over her head. Her story, like many others, reveals one of the many ways one can become homeless due to circumstances out of their control. "I was in an alcoholic marriage," Shockey said, recalling one specifically dark night, "We got into a fight and he put me out at 2 in the morning with nowhere to go. I was on the streets for about 3 weeks going from place-to-place the first time. The second time I ended up at the shelter, Harvest Home." Shockey, now a 4th year volunteer for Project Homeless Connect (PHC), a one-stop-shop for the homeless, used those circumstances not only to better her life, but the lives of others. She considers it a blessing to be able to give back. "I enjoy doing it because it's a reminder to me that that could be me again," Shockey said. Now she gives of her time to various charities and even opens her door to the homeless. At one point, she had 20 homeless people staying at her house. "I've been there. I know what it's like. I have a job now which I'm very grateful for and I just love to help people. That's my way of giving back to God, the church, and the homeless," Shockey said. 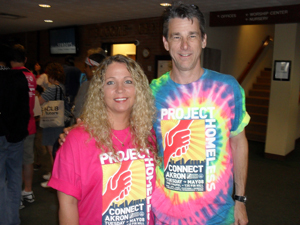 This past May 8th marked the 5th year of Project Homeless Connect here in Akron. This "networking" day for the homeless allows them to connect to the community and its resources, and receive an abundance of services free of charge. "It's really a unique model, a national model that's been very effective in terms of bringing a lot of people to collaborate together," Sean Freeman, President of Cole Industries, who runs the clothing area of PHC, said. Eight-hundred people filled The Chapel that day, including 600 volunteers, to guide the homeless through the large building, making sure they received the services they needed. This included everything from haircuts, to tooth extractions, to legal help. 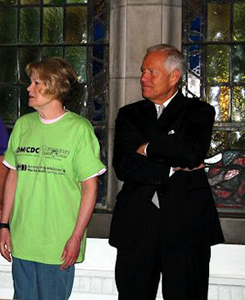 "The day was kicked off by Mayor Don Plusquellic and County Executive Russ Pry. They absolutely wanted to be here to thank the over 600 volunteers we had. They saw a sea of hot pink," Sue Pierson, Director of Info Line Inc., said of the volunteers who were wearing bright pink t-shirts. She says that there were already about 100 homeless lined up at 6:30 a.m. when she arrived. Jennifer Giebas, who moved to Akron from New Jersey about 6 months ago, says PHC, is "amazing" and that where she used to live "you would never find services like this". "Everything you needed was here today and I thought that was just great," Giebas said, with an enthusiasm that was contagious. "I'm not that community based here yet, so I got to meet other people going through the same situations. I'm definitely not alone," she continued. Here she was able to get a haircut, and some Redkin shampoo, which made her day. "I needed it. I don't have any money to do that," she said. 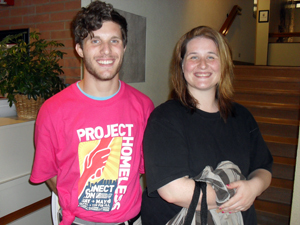 Blake Norton, a volunteer with Campus Focus, helped Giebas around the building and was surprised by the services offered as well. "I'm part of Campus Focus and we're doing Project 192 where all of us college students stay in the houses with campus focus leaders, so we came out today, all of the houses, just to help volunteer and chaperone," Norton said. "This is my first year and I think it's great. I was surprised by how much people donated and how many services there are. The fact that there are so many people cutting hair and all of the dental stuff, I was impressed. It's really great," he continued. 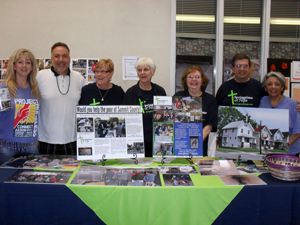 Many friendships were made between the volunteers and guests. "The volunteers are amazing. It changes lives. I was really glad to be here," Giebas said of her experience. The main theme throughout the day was of how generous of a city Akron is. "It's nice to know what they offer out here cause in New Jersey there's nothing. Nothing. They'll (tell you to go to) Salvation Army and figure out life," Giebas said. Samantha Byrd, 21 years old, with 4 children, was also down on her luck, but PHC put a smile on her face. "It's a good opportunity for people that are really in need," Byrd said, "I have an apartment; it's just that the economy's really bad and I just had two kids in a row. Nobody wants to hire someone who hasn't worked in 2 years, so its jobs and a struggle with food." Her fiancé, whom she said had "bad teeth", was getting them pulled. These are the types of services these people could otherwise never afford. "I love it. It's huge here and has great opportunities for everybody," Byrd said. Don't miss Part Two next week, where more volunteers and agencies share their experiences on this life-changing, one-day event!